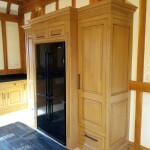 This limed oak kitchen in Bedfordshire had been fitted over 20 years ago when the house had been built. 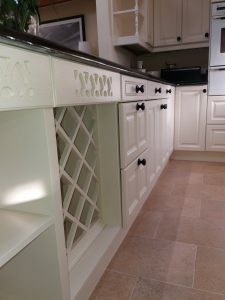 The clients were not sure that there kitchen cabinets could be painted, So searched on Google and found my details on traditionalpainter.com with my son we cover Northants, Beds, Bucks & Herts, if you are not in one of these areas you will find details on the website of your nearest traditional painter. I explained to the clients the process we would go through, After deep cleaning with a degreaser and a complete sand down. I would prime with Tikkurila Otex oil based adhesion paint, This would also act as a stain block incase of any tanning bleeding through the paint film from the oak. I then applied a 2nd coat as an undercoat and completed with Benjamin Moore Advance satin waterborne top coats. The clients where delighted with another example of what is possible with a very dated but well designed and well made kitchen. Notice how the new black handles really stood out against the off white paint finish. The New Paint System would have been touch dry the same day and been usable within a couple of days. It would have fully cured after about 28 days. At this point the surface paint ia at its peak durability, And would be good for years to come. 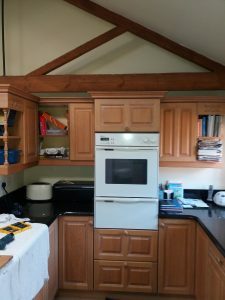 A lot of thought has gone into ways of leaving clients with the minimum of disruption, For me the anwser is to remove doors and drawer fronts and complete them in my workshop. With the frames fully exposed, I apply the full (prep & paint) treatment to everything left in stiu. I then leave the clients in peace to complete the bulk of the work in my workshop. 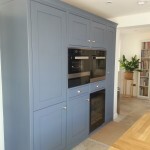 Paint and oak are a great combination for a hand painted kitchen, And lifts the whole look of the kitchen bringing it up to a new modern look. 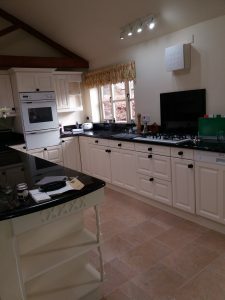 Paul and his son cover Northampton, Beds, Bucks & Herts, He has been painting kitchens since the early 80s and there is not much he hasnt seen or solved. If you need advice on hand painting a kitchen, Paul is happy to explain how he would turn your kitchen around with a durable paint finish. 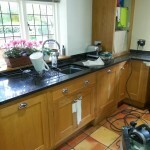 You can ask for a full no obligation quote which he will provide Free Of Charge . I normally work on around at least a 3 month lead time, So its best to plan well ahead. This Review Was Posted On My Website After We Completed This kitchen. Our kitchen was 25 years old, basically sound but the limed oak in serious need of rejuvenation. 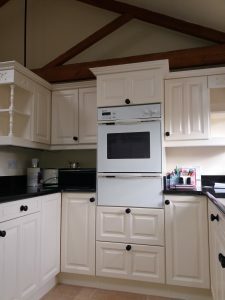 We had been advised that the units were of good quality and having recently fitted granite tops a new kitchen was out of the question, not least due to cost. Having researched the options we identified Paul Barber as an appropriate tradesman to paint the kitchen a view confirmed when we realised how much in demand he was, a 4 month waiting list, a fair indication he was good. Paul arrived at the end of February 2018 and explained the process and he followed this accordingly, with us missing doors and drawer fronts for over a week. When they were returned we hardly recognised them. Then came the on-site hand painting of the in-situ shelves, newel posts and architraves which were finished perfectly without the trace of a brush stroke. 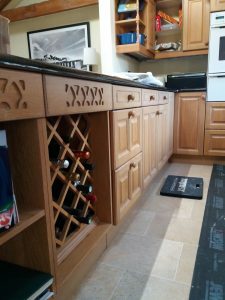 Paul also advised on the replacement knobs, which he fitted, all 35 of them, as well as carrying out remedial work on door hinges, drawer slides and ill-fitting kick boards. 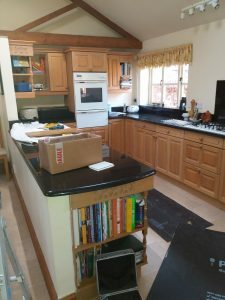 It is an amazing transformation and we feel like we have a new kitchen. We would highly recommend Paul as a genuine craftsman; reliable, thorough and seeking the highest standards of workmanship.